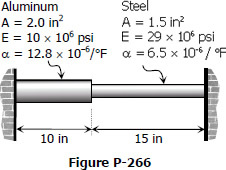 A compound shaft consisting of a steel segment and an aluminum segment is acted upon by two torques as shown in Fig. P-316. Determine the maximum permissible value of T subject to the following conditions: τst ≤ 83 MPa, τal ≤ 55 MPa, and the angle of rotation of the free end is limited to 6°. For steel, G = 83 GPa and for aluminum, G = 28 GPa. A 5-m steel shaft rotating at 2 Hz has 70 kW applied at a gear that is 2 m from the left end where 20 kW are removed. At the right end, 30 kW are removed and another 20 kW leaves the shaft at 1.5 m from the right end. (a) Find the uniform shaft diameter so that the shearing stress will not exceed 60 MPa. (b) If a uniform shaft diameter of 100 mm is specified, determine the angle by which one end of the shaft lags behind the other end. Use G = 83 GPa. The steel shaft shown in Fig. P-314 rotates at 4 Hz with 35 kW taken off at A, 20 kW removed at B, and 55 kW applied at C. Using G = 83 GPa, find the maximum shearing stress and the angle of rotation of gear A relative to gear C.
Calculate the increase in stress for each segment of the compound bar shown in Fig. P-266 if the temperature increases by 100°F. Assume that the supports are unyielding and that the bar is suitably braced against buckling.